Join us for days of singing, cooking out on the campfire, games, unique arts and crafts and so much more! 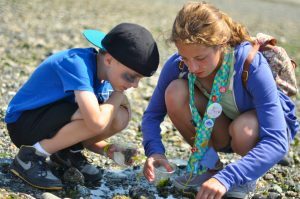 Our Day Camps take place at parks throughout the Seattle area and are led by fully-trained and caring volunteer staff. Kids will experience how fun the outdoors can be while learning important life skills and interacting with kids from a variety of socioeconomic, racial, cultural, religious and disabled populations. In Camp Fire, everyone is welcome! Boys and girls in grades K-7 are welcomed as campers and are assigned to a small group of youth their own grade for the entire week. These small groups of kids are assigned to one adult staff or experienced older teen counselor and at least one assistant teen counselor, and stay together for the whole session. For older youth and adults, there are many exciting volunteer opportunities! We bring Day Camp to a neighborhood near you! Our camps are located all throughout the Puget Sound region, including Seattle, Bothell, Woodinville, Issaquah, Kent and Port Orchard. Find a camp near you! 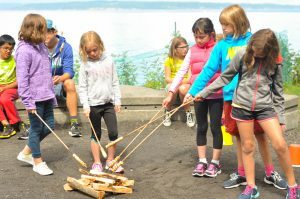 Camp Fire Day Camps are accredited by the American Camp Association, meeting high standards in health, safety, and program quality. 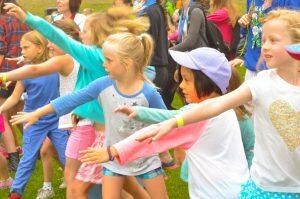 Learn more about Day Camp activities, traditions, our commitment to inclusion, special diets & allergy accommodations, and more! Find updates, details for parents, packing lists and more to help you get your child ready for Day Camp! Our Day Camps are possible through a dedicated and talented team of volunteers. Volunteer opportunities exist for adults and teens entering 9th grade and up.